Ko‘olaupoko District is one of seven Hawai‘i state divisions for the Island of O‘ahu. Ko‘olau Poko or "short Ko‘olau," is one of two districts (along with Ko‘olau Loa or "long Ko‘olau") making up the ko‘olau (meaning "windward") side of the Island of O‘ahu and encompassing the lands on—and reefs offshore of—the northeast-facing slopes of Ko‘olau volcano (one of two shield volcanos that formed the Island). Within the ‘okana of Ko‘olau-poko occur eleven ahupua‘a. These traditional land units are here the gateways to the windward watersheds of O‘ahu. Regional descriptions and history may be accessed through the watershed ring; area stream descriptions and water quality through the stream ring; and shoreline and marine environments through the marine ring. [GO TO A NO GRAPHICS HOMEPAGE]. 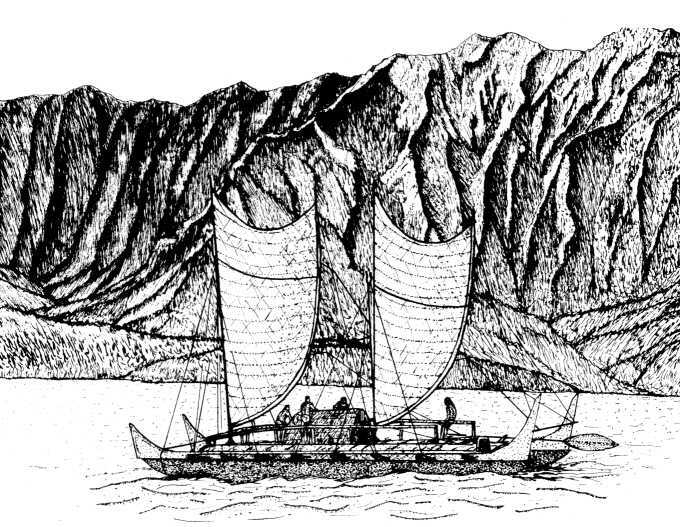 CREDITS: "Hawaiian voyaging canoe in Kāne‘ohe Bay" by Frank Eble, from Marine Corps Base Hawaii - Kaneohe. 1997. Mokapu. A Journey in Time. Historic Tour and Guide (pamphlet). Frank Eble died in January 2001 and will be missed by all those who knew and worked with him.